Scottish Secretary David Mundell has denied that he threatened to resign over Brexit. It had been reported that both he and Scottish Conservative leader Ruth Davidson told the prime minister that they could not support any different arrangements for Northern Ireland. They said this would "undermine the integrity" of the UK. Speaking earlier after a UK cabinet meeting, he insisted it was not a threat to quit. Mr Mundell told the BBC: "I haven't threatened to resign. "What I've said is that I regard the integrity of the United Kingdom as absolutely essential in these negotiations. "We're not going to prejudice the integrity of our United Kingdom and I'm very pleased - as you would see in yesterday's statement - that the prime minister is absolutely behind that." 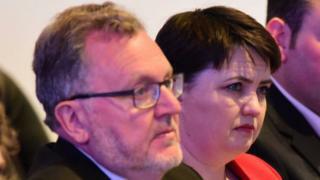 Sources had told the BBC two days ago that Ms Davidson and Mr Mundell have made it clear they would resign if Northern Ireland faces new controls that separate it from the rest of the UK - because that could fuel the case for Scottish independence. A source close to Mr Mundell told the BBC: "If you find yourself not agreeing with government policy" resigning would be the "logical outcome". A source close to Ms Davidson said the issue was a "red line". In the letter to Theresa May, the Scottish Tory leader and Scottish Secretary said: "Having fought just four years ago to keep our country together, the integrity of our United Kingdom remains the single most important issue for us in these negotiations. "Any deal that delivers a differentiated settlement for Northern Ireland beyond the differences that already exist on all Ireland basis (eg agriculture), or can be brought under the provisions of the Belfast Agreement, would undermine the integrity of our UK internal market and this United Kingdom. It added: "We could not support any deal that creates a border of any kind in the Irish Sea and undermines the Union or leads to Northern Ireland having a different relationship with the EU than the rest of the UK, beyond what currently exists." Reacting at the time, First Minister Nicola Sturgeon tweeted: "We'll resign if you do anything that makes Scotland think there's a better alternative to a hard Tory Brexit' say Mundell and Davidson! "First, what a bizarre position - isn't it their job to stand up for Scotland? And, second, have they the gumption to resign? I bet they don't!" Labour MP Ian Murray tweeted: "But they also don't want to continue to participate in the customs union and single market so how do they suggest resolving it? Utterly contemptible. "They can't achieve a no hard border in Ireland without participation in the same trading arrangements as the EU."